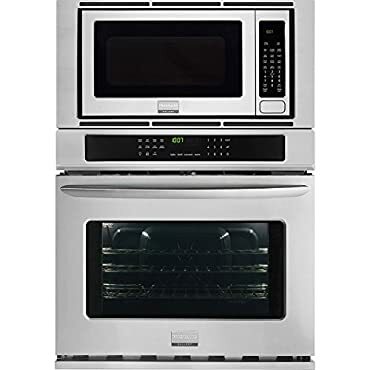 The Frigidaire FGMC3065PF electric wall oven/microwave combination boasts dual versatility with a high-performance oven and microwave in one. Smudge-Proof stainless steel resists fingerprints and smudging for easy cleanups. Effortless Convection delivers fast, even-baking versatility. Plus, it preheats in less than six minutes to save you time. Even baking technology ensures even baking at all times. This 4.6 cu. ft. stainless steel Frigidaire FGMC3065 boasts a Fits-More Microwave oven with 2.0 cu. ft. of cooking space. A handy Pizza Button bakes the perfect pizza at the touch of a button. And a Quick Clean option delivers light oven cleaning quickly and simply. And, this high-performing oven combo built, designed and engineered in the USA to ensure the highest quality standards. Coupon Details: Get $464.10 OFF automatically when you add this item to your cart!